We’ve got a great line up of speakers in this year’s Lecture Programme, which starts on Wednesday 10th October and runs until Easter. 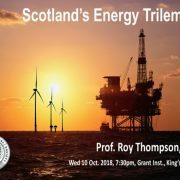 Our Lectures are held on alternate Wednesday evenings, usually in the Hutton Lecture Theatre in the Grant Institute of Geology, The King’s Buildings. These are free and aimed at anyone with an interest in Earth science. Afterwards, you can join the speaker and members of the Society for a cup of tea and a chat. 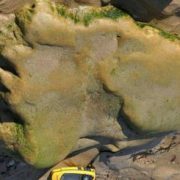 Evidence of fossilised dinosaur footprints has been found on the Scottish mainland for the first time, on the coast near Inverness. 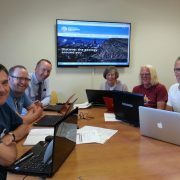 The exact location is being kept secret to enable researchers to have access to the site. 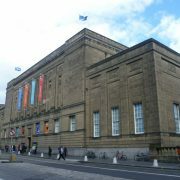 The discovery, by Dr. Neil Clark, Vice-President of the Geological Society of Glasgow and Curator of Palaeontology at the Hunterian in Glasgow, has been hailed as a significant find. 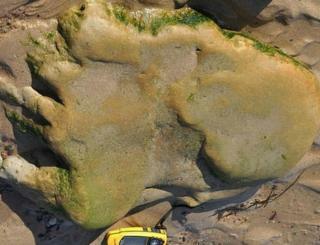 The main site for dinosaur footprints and bones in Scotland is on the Isle of Skye and this significant new find is likely to give further insight into the dinosaurs of the Middle Jurassic period, some 170 million years ago. It is thought that the size of the newly discovered prints suggests they were left by a member of the sauropod family – large herbivores which stood up to 18 metres high. 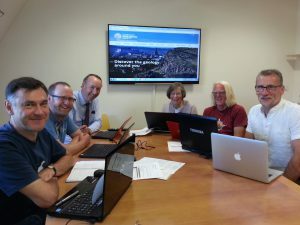 This news item is to linked to a previous story posted on the EGS website – Preserving dinosaur footprint sites in Scotland. 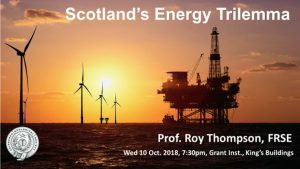 Professor Roy Thompson of the University of Edinburgh has supplied written evidence to the Scottish Affairs Committee Inquiry (at Westminster) into The Future of the Oil and Gas Industry. 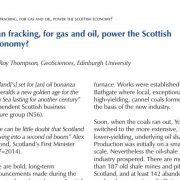 This evidence comes as a follow-up to his article in The Edinburgh Geologist (Autumn 2017) on ‘Can fracking, for gas and oil, power the Scottish economy?’. His key point is that, despite the North Sea being a geologically well-studied, mature oil-province, surprisingly large discrepancies remain over best estimates of oil and gas reserves. Estimates currently vary between 4.8 and 80 billion barrels of oil equivalent (bboe) for the UK continental shelf. This corresponds to a difference to Scotland’s economy of about $4 trillion – assuming approximately 90% of the oil lies in Scottish waters and commands an average price of $90 per barrel. 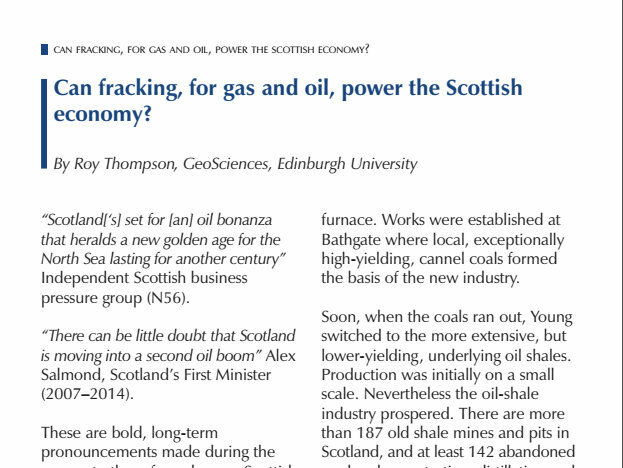 His recommendation is that in order to determine the likely size of the UK’s ultimately recoverable oil and gas reserves, a poll of stakeholders be conducted, asking each to provide a quantitative, evidence-based estimate of economically viable production potential. 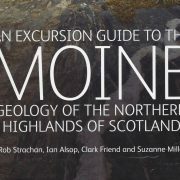 News from our Publications Sales Officer, Don Cameron is that the Moine Guide has now been reprinted. 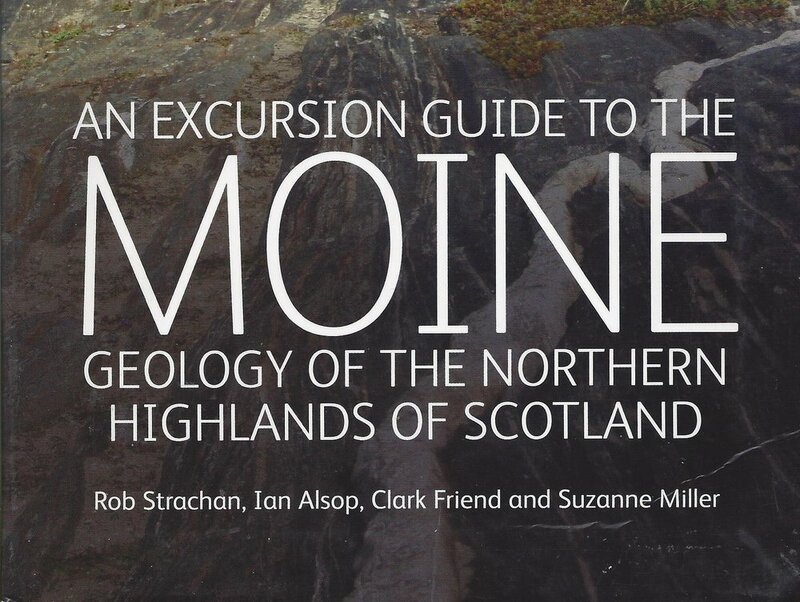 He has a good stock of guides available for EGS members at the reduced price of £14.40. The non-members rate is £17.99. Please contact Don if you would like to purchase a copy. The annual joint field trip with the Glasgow Geological Society took place to Perth City and surrounding Kinnoull Hill on Saturday 30th June 2018. The visit was led by Con Gillen (EGS) and examined both the Devonian volcanic and sedimentary rocks (Lower Devonian) of the surrounding area. The later rocks being famous for supplying the source rock for the Stone of Destiny. 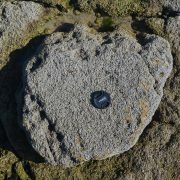 In addition, the trip also included ample opportunity to see the wide range of building stones used in Perth City Centre. The large group, approx. 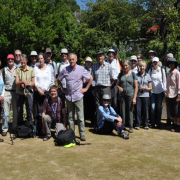 30 members enjoyed the expert guidance of Con (along with the impressive work of those who compiled the Perth Excursion Guide). 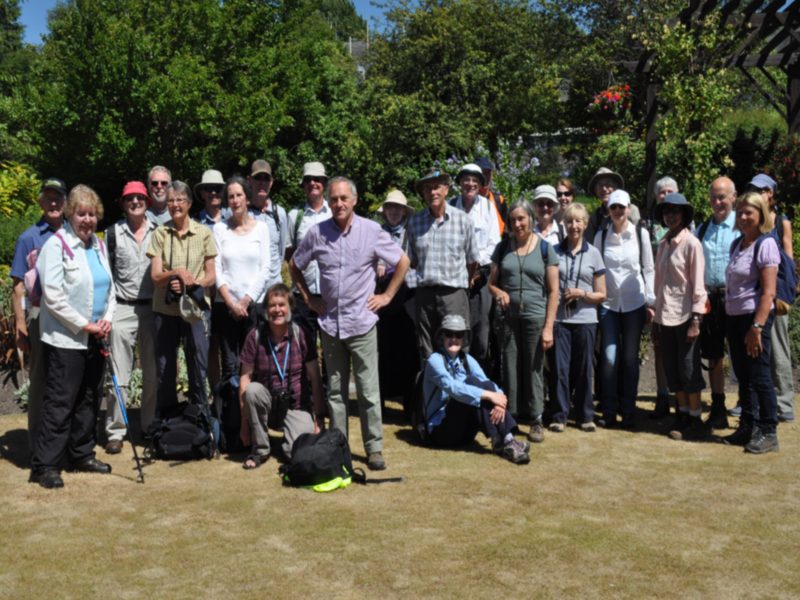 The splendid sunny day enabled us to capture the group in the Rodney Gardens, Perth – where lunch was had. The day also ended with a lovely high tea to round off another great field excursion. 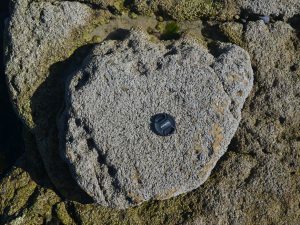 To celebrate the rich variety of Edinburgh’s geology and the number of Earthcaches in the area, the Edinburgh Geological Society has produced a souvenir Edinburgh Earthcache Geocoin. 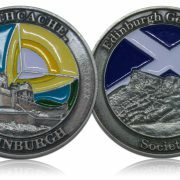 This is an attractive trackable silver coin with views of Edinburgh Castle and Salisbury Crags. 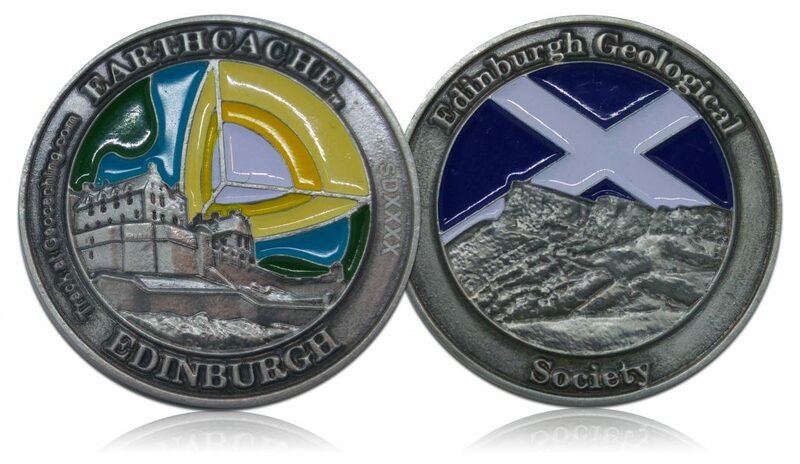 Find out more about Earthcaches and purchase the souvenir coin here. 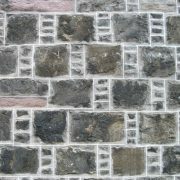 This CPD training session on stonework is one of a series organised by Edinburgh World Heritage. These are opportunities for conservation architects, planners, students and any other interested parties to learn about specific aspects of the management of the built environment of the World Heritage Site. It is taking place on Tuesday 19 June, 9am-1pm at Walpole Hall, next to St Mary’s Cathedral in the West End. Tickets are on sale now, with a discount for EWH members. As the saying goes, we aim to leave no stone unturned when it comes to discussing stonework. The event will explore all aspects of stonework from the quarry to the workshop and beyond. It will be an opportunity to learn about the life-cycle of stone, how it is utilised in conservation work and how best it can be maintained and preserved. There will also be the chance to learn from the masons at St Mary’s Cathedral with a practical workshop demonstration. The RIAS is happy to recommend this event to its members, and it is recognised by the IHBC for CPD.